Radius Bundle - Simple but Kool! 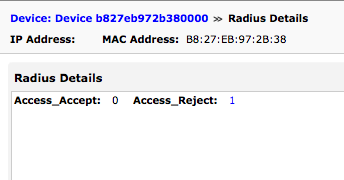 We had a partner that asked about looking into Radius Access Rejects, and being able to report what username was failing. This quick-and-easy bundle shows you the number of access accepts and rejects (same as the default AAA screen), but the still in for this case is the actual username, as opposed to the client IP. This bundle contains the trigger and the pages needed.